I have to say I was not a fan of Alyxandra Harvey and was one of the few people I knew who didn't carry on with her vampire series. This meant I approached this book very warily. However I shouldn't have been worried because I really enjoyed Haunting Violet and would definitely recommend it to others. The thing that did it for me with this book was the setting. It is set in Victorian England and I felt that you got a real sense of the time period whilst reading it from the surroundings and the customs followed and it really felt like the author had done her homework to ensure every little detail was just so. I loved Violet as a character and felt that the author did a brilliant job of making her modern and easy to relate to as well as fitting her in with the time period she belongs in. I particularly enjoyed seeing how she got to grips with her new found powers and how she balanced in her use of them compared to her mother who claimed to use similiar ones fraudulently. I loved Colin (never thought I'd swoon over a man named Colin ... I suppose there is a first for everything) and his continually changing relationship with Violet. I'm not going to say much about how it all turns out but needless to say I loved it. The story itself is based around a murder mystery involving a victim whose spirit appears to violet. Again I loved this take on things and really enjoyed following the story as violet started to find out what happened. Good review! How come you weren't a fan of the drake chronicles? Yay! Glad you loved it too. 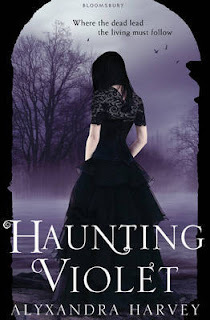 I love the pretty purple cover on Haunting Violet, but I have heard such mixed things about Alyxandra's books that I wasn't sure whether to read it or not. I think I probably will now. It sounds great. I started this one awhile back but couldn't really get into it. Perhaps all I needed was some time and to read a few really good reviews of it! I shall try again, thanks.